Last month, I made a big push with my November to Remember, No Excuses November, 30-day challenge 2018 to do a modified version of the Parkinson’s Recipe for Recovery® for 30 days. The 30 days ended yesterday, November 30, 2018. So, what’s next? Where do you go from here? Yesterday was November 30, 2018 and today is December 1, 2018. We have a way of putting labels and limits on our lives based upon what somebody at some previous time decided was correct. Theoretically, if somebody’s decision had been different, today would be November 31, 2018. What I am trying to point out to you is that much of what we think is real is a script written by somebody else, and we have been following the script and its rules without question. Where is your mind? When you are sharing the universal energy with each other, bringing yourself into the moment RIGHT NOW, and feeling each other’s love and compassion, you cannot answer the question “where is your mind,” because your mind leaves, and your heart controls the moment. Where is my mind? I do not know. I am in my heart. Today is December 1, 2018. How about that. What are you doing in the moment RIGHT NOW? 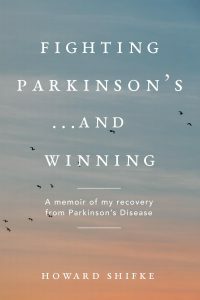 9 Responses to Fighting Parkinson’s, and being in the present moment RIGHT NOW! Right now we thank you for your great support you are giving us during the whole year. Right now it’s time too to thank you for your tireless effort, you know no end and we appreciate your work very, very much. What would we do without you? So right now you can be very proud of yourself what you Show us as a real example of your own cure, THANK YOU!! Gosh Howard…this is one heck of a life-giving post. I’m continually blown away by your wisdom and generosity in sharing and coaching…sending love and gratitude to you dear soul. Yesterday I took my last half pill of sinemet. I am drug free today ! I want to thank Howard for his caring words during our coaching sessions and all the people committed to recovering from Parkinson’s Disease. I am looking forward to a complete recovery and to continuing to spread the word that PD is a choice not a sentence. Congratulations, Beth, and very best wishes to you! Hi Beth, Congratulations! Great job! I’m very proud of you!